Give us your time to help guide you through what most Bruder Land Rover toys have to offer the child, featuring lots of functions and replica detail. There's choice between getting hold of a standalone model, or a Rover with one of many trailers it comes with. If you don't have a trailer right away, that's no trouble as one can be bought later. 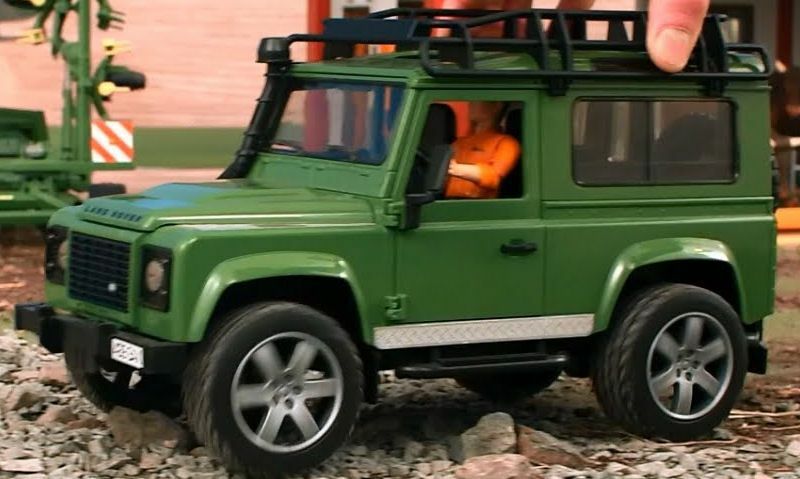 What you should expect with all Bruder toy Land Rovers is this; active steering, opening doors and room inside the interior for Bruder figures - as we explain all this below. As you'll expect with all Bruder vehicles, they all get the full active steering treatment. No muss, no fuss, if they have to steer without using any awkward gizmo's, they can do so by manually controlling the front steering on the front wheels. But we have to say, using the steering rod is far more enjoyable. Located beneath the Land Rover, unclip the steering rod attached to the chassis, then bring it to the top to thread through the cab roof window. Slide open the clear window sun roof to pop the steering rod through the sun roof through the available gab - the limited gap here helps limit the movement of the rod. Thread it through to reach the corresponding device in the centre of the driver's cab, between the seats at the front, until you here a loud click. Once you've found its place and its clipped in nice and tight, they're free to control the wheels and steer - with tight movement - left and right well pushing and pulling to go forwards or reversing. Don't worry, the steering rod can take the rough with the smooth. Again with all Bruder Land Rovers and vehicles, there's a rear hitch that is there to connect any tow bar from the Bruder trailer range. Now this is a Land Rover so is only suited to tow suitable farm trailers. In that we mean it is suited to tow the cow and horse trailers. Anything else is classed as a farm implement, and should really be towed by a Bruder tractor. Rear hitches on this Land Rover series is detachable, and for good reason. To open the rear door the hitch is out of the way, but if its risen above is natural sitting place it will prevent the door from opening, this is also true if a trailer is attached. So for your convenience, the hitch can easily be remove by popping it up and off. Bruder Land Rovers are commonly featured with up to five opening doors. The most important ones of all are the front driver and passanger doors. These doors open as normal, allowing access to the seats and steering wheel. Then there's the rear door for accessing the back. Again open it like any door with the spare wheel helping you open with something to grab. And then there's the bonnet, Bruder provide an opening door to allow the kids to inspect the inner workings of an engine on a Land Rover and vehicles. Once its opened, use the support bar that folds up to keep the bonnet cover up. Finally, there's the small sun roof window that slides open so you can pop the rod in. If you compare Bruder Land Rovers to say Britains Big Farm Land Rovers for example, one notable difference is Big Farm offers lights and sounds. Naturally this function alone can win over any child, with realistic engine sounds, horns and light up headlights. But there's a catch, because this means if these Big Farm Land Rovers get wet, then its highly lightly the function will stop working, and will certainly become dangerous. And this is not true here, Bruder Land Rover's do not have lights and sounds, therefore they don't require batteries and have no interior circuitry at all. What this means for you is well, you don't have to worry about buying or charging batteries, and having to put up with that noise all day long. More importanly, and taking into consideration Bruder's tagline, for Indoor and Outdoor use; you can do just that in all weather, the cold or dampness can't ruin the model. When you’re in need of a 'quality' toy Land Rover Defender you'll have a choice between Bruder and Britains Big Farm Land Rovers, everything else is of inferior quality. Well Bruder released there own version several years ago, the Britains Big Farm label was released later and so was their big toy Land Rovers too. But as you’ll find out, well Bruder versus Big Farm models measure up to 1:16 scale beautifully, they very hugely in fun features and functionality. So, let's take a look at their features and how they compare when up against each other using our table below. Well Britains Big Farm is a lovely model, you just can't beat the outdoor durability of Bruder models. Thanks to no batteries, there's no risk to them getting wet and the interior circuitry getting damaged. But that's not all, well Bruder and Big Farm have active steering, Bruder's are controlled using a steering rod that threads through the roof and hooks onto the steering gizmo. Britains Big Farm you can only control it with your hands. So there you have it, when it comes to Britains Big Farm vs Bruder Land Rover Defenders - Bruder wins hands down, and should be your first choice. Now that we've gone thoroughly over the features and functionality each and every Land Rovers has to offer, let's see what there is available. Starting out on the list are standalone models, useful if a trailer isn't needed but the option to buy one later is available to you with a big range. Then we'll move onto toy Bruder Land Rovers with trailers. And as you'll see, these are not exclusive to farm vehicles, but construction, hobby, fire and police vehicles too. 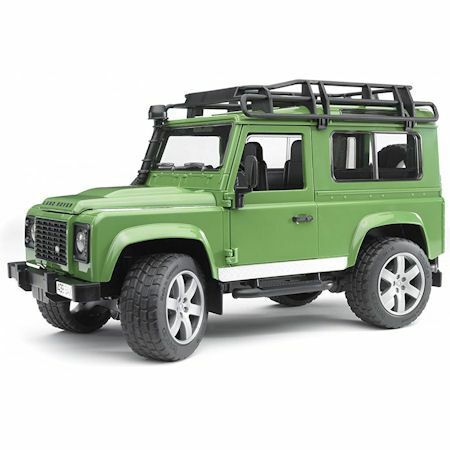 Bruder Land Rover Defender available in a stunning green, with black features and metal effect trim. Its fitted with a roof rack, folding side mirrors, free rolling wheels, opening tailgate and bonnet with opening and closing doors. Steer the vehicle using a steering rod popping through the roof, made from durable plastic and rubberised tyres. As you see, well it only comes as a standalone model, there's sure lots of features and functions that will keep them satisfied, without the need of a trailer. Not a common design of a Land Rover this one is it, I mean this is a customised vehicle for a hotter climate, so perhaps its for use on the beach in California. That has to be Bruder's thinking with this sporty Land Rover, but saying that without a roof you'd have to agree, access to the steering is much easier. As usual it has all the odd-cons, steering, opening doors, tailgate and bonnet. The area in the back will allow easy transport of items including Bruder figures. Well its not ideally suited to farming, it will match a horsebox trailer or one of those sporty trailers with a hobby vehicle now available. 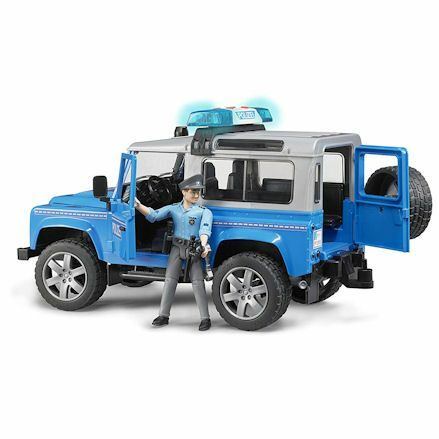 Bruder 02597: Land Rover Defender Police Dept. How about that then, a Bruder Land Rover sporting police colours; so now we finally have a vehicle that can do more than just farm work. Again, you won't see a police Land Rover, but Bruder have made is so with this colourfully finished model in police signia and working lights and sounds, with a siren. This lights and sounds model you would have to agree would make a lots of fun during play, and well it makes realistic siren noises, the light flashes around also. This model is only a customised version of earlier releases, but its this conversions that makes the model far more interesting. Well it won't match most trailers as well, why not hook up the horse trailer with horses, so then you have your very own police horse. This is all verified with the policeman figure, well he does his job of catching baddies, he is also capable of driving the vehicle. 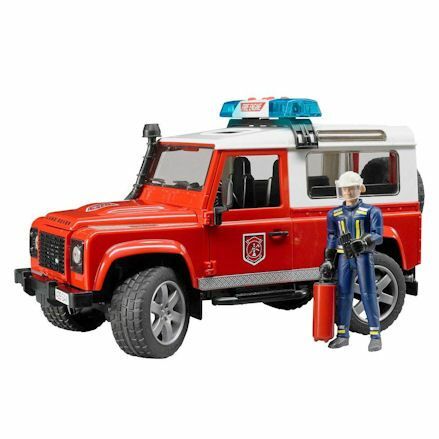 Bruder 02596: Land Rover Defender Fire Dept. Suppose you can't have a police Land Rover without more emergency services, and in the case a fire department vehicle in classic red colour with a fire man figure. And well you have a choice between the police and fire Land Rover, we highly recommend you go for the police vehicle, and save your fire dept. vehicle budget for a Bruder fire engine toy. You see there's plenty of Bruder fire engine toys to purchase, so it only makes sense to go for a big fire engine to compliment the Bruder police car. Then again, if you do choose to go for this model, it can be used as a fast response vehicle to get there before the fire engine does. It has all the usual features, and comes with a fun fire man with exhaust and accessories. 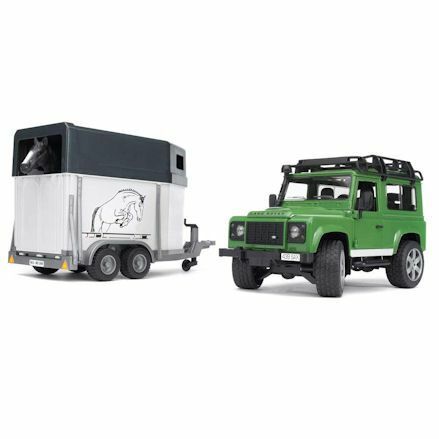 After the functionality of the Bruder Land Rover as to offer, the next best thing is this Bruder horsebox trailer - and bonus - its comes with Bruder black/brown horse figure. The horse trailer will hook up to the Land Rover the usual way, and well it sit's on a twin axle, this alone it not enough to keep it balanced when unhitched. Therefore the use of the jack wheel will need to be lowered to the ground to stop it tipping. The rear door can fold down, acting as a ramp. This doorway is then used for the horse to be loaded or offloaded. We go over the exact Land Rover appearing on most vehicle and trailer sets, so we won't do that again here, because this time the trailer is a unique design. Technically it functions the same, it has a single-axle with a fold down tailgate that acts as a ramp for loading vehicles, plus a wheel jack for parking the trailer. But this set is for the building site, thanks to the multi-functional digger, or to be more precise, the JCB compact excavator. You'll need this excavator for all the little jobs, or it may need dropping off at the building site as its been hired for the day. 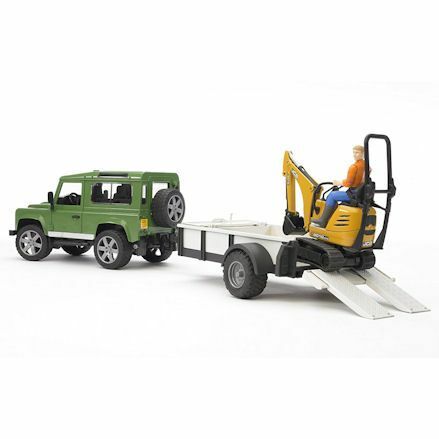 The Land Rover has features explained above, but the excavator runs on tracked wheels with a turning body where the figure sit's, and a working arm with pivoting bucket. 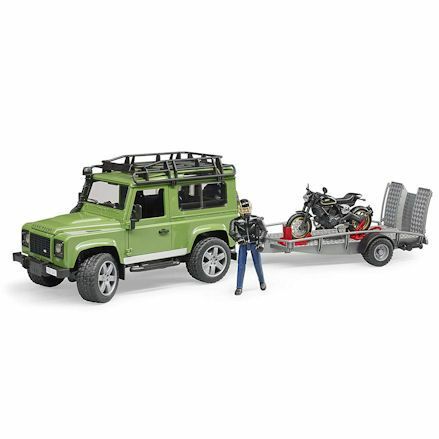 You're in a safe pair of hands with this same Land Rover Defender that appears with multiple vehicle/trailer sets. And here it is again with this one. Only this time you get the popular Bruder (02590) available in this set or bought separately. Also the trailer you'll notice is becoming one that features among all the Bruder sets. This time its carrying a functional snowmobile. If there's no snow where you're for playing, not to worry its will slide on the carpet with no problems. The Bruder figure will jump on the snowmobile for fun, or use the whole set as a sort of snow mountain rescue operation - let the imagination run wild. 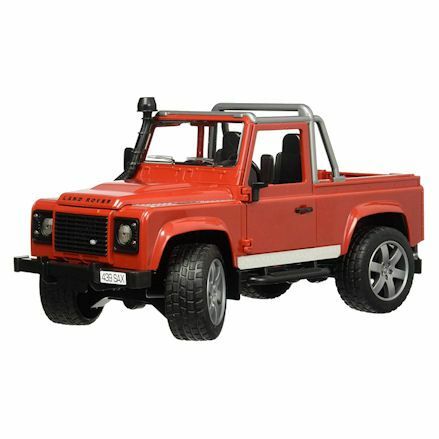 A previous release of this exact Land Rover used to come in red, now all new releases are in this mix between orange and grey. 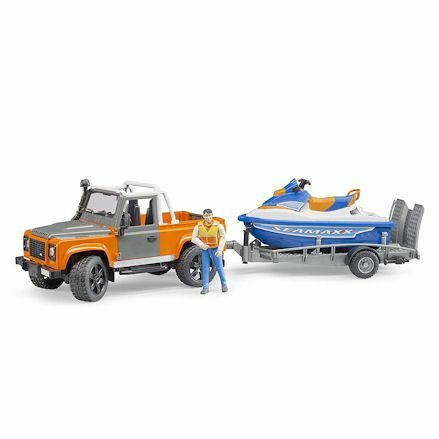 As its an open back sporty Land Rover, you can bet this represents a hobby Land Rover and trailer set - and it is as it comes with a realistic water jet ski. 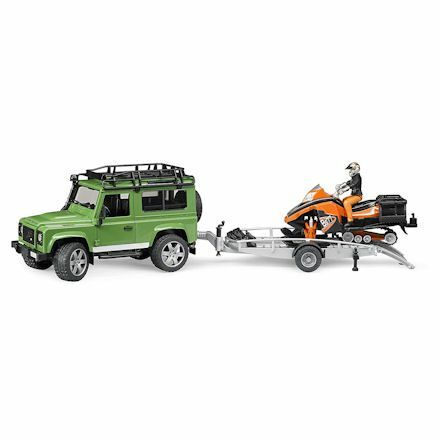 The general purpose trailer has a fold down rear tailgate where its lowered down to the water where the jet ski is driven off. This same Bruder jet ski can be rode with the figure who also acts as the Land Rover driver - wearing a life jacket. Features of the Land Rover is focused on the opening doors and rear steering. Did you know this Land Rover can be bought as a standalone model, or with a trailer. And in this case its the Bruder (02590) Land Rover with a trailers with a nice looking Ducati motorcycle. The Land Rover as all the features explained many times, well the trailer attaches to the rear hitch with ease. The trailer has pull down double tailgate ramps to offload and load up the bike on the trailer for taking to the racing track. Don't worry, the motorcycle can be ridden with the Bruder figure wearing motorcycle gear, including a leather effect jacket and helmet.